Westport, CT - Westport Country Playhouse will present a Script in Hand playreading of the romantic comedy “The Cemetery Club” on Monday, February 25, at 7 p.m. Written by Ivan Menchell, the reading will be directed by Anne Keefe, Playhouse associate artist and curator of the playreading series. Tickets are $20 each. Three Jewish widows meet once a month for tea before going to visit their husbands’ graves in this hilarious, yet moving comedy. Ida is sweet tempered and ready to begin a new life; Lucille is feisty and just wants to have fun; and Doris is priggish and judgmental. When Sam, the butcher, meets the widows while visiting his wife’s grave, he is attracted to Ida, even as Doris and Lucille try to squash their budding romance. “It’s very funny and touching and perfect for lightening those mid-winter blues,” said Keefe. 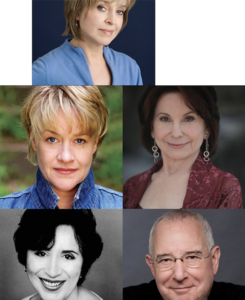 The cast includes Jill Eikenberry as Ida (NBC television’s “L.A. Law” - Golden Globe Award, Emmy nominations; Broadway’s “Moonchildren,” “Watch on the Rhine”; Off-Broadway’s “Life Under Water,” “Lemon Sky” - Obie Awards; films “Arthur,” “The Manhattan Project”); Deirdre Madigan as Lucille (Westport Country Playhouse’s “And a Nightingale Sang,” “A Marriage Minuet,” “A Few Good Men,” Script in Hand playreadings of “The Supporting Cast,” “Social Security,” “The Late Christopher Bean”; Broadway’s “A Delicate Balance,” “Who’s Afraid of Virginia Woolf?,” “After the Night and the Music”); and Carolyn Mignini as Mildred (third season as Maggie Gyllenhaal’s mother on HBO’s “The Deuce”; portrays Ilene Mulvaney on Showtime’s “Escape at Dannemora”; numerous Broadway and off-Broadway credits, including “Tintypes” - Drama Desk nomination, and Christopher Durang’s “Sister Mary Ignatius Explains It All for You”). Also in the cast are Maria Tucci as Doris (Westport Country Playhouse’s Script in Hand playreadings of “Collected Stories,” “Over the River and Through the Woods,” “The Bread Winner,” and “Morning’s at Seven”; Tony nomination for Broadway’s “The Rose Tattoo”); and Michael Tuckeras Sam (NBC television’s “L.A. Law”; many stage and film credits; writer of three memoirs, a novel, and two plays, including “Fern Hill,” opening in September at 59E59 Theaters). Playwright Ivan Menchell wrote a screen adaptation of “The Cemetery Club,” starring Ellen Burstyn, Diane Ladd, and Olympia Dukakis. Broadway credits include “Bonnie & Clyde” (book), “Chitty Chitty Bang Bang” (additional material), and “The Cemetery Club.” He was also a writer/producer on the long-running CBS comedy “The Nanny.” Menchell is a graduate of the Yale School of Drama. Director Anne Keefe served as artistic director of Westport Country Playhouse with Joanne Woodward in 2008, and as associate artistic director from 2000-2006, also with Ms. Woodward. She co-directed with Ms. Woodward the Westport Country Playhouse production of “David Copperfield,” and directed many Script in Hand playreadings. Upcoming Script in Hand playreadings include “Tricks of the Trade,” a thriller by Sydney Michaels, on March 25; and “Murder, Too,” a new comedy thriller by David Wiltse, on May 6. Titles will be announced later for playreadings on November 18 and December 16. The mission of Westport Country Playhouse is to enrich, enlighten, and engage the community through the power of professionally producedtheater worth talking about and the welcoming experience of the Playhouse campus. The not-for-profit Playhouse provides this experience in multiple ways by offering live theater experiences of the highest quality, under the artistic direction of Mark Lamos; educational and community engagement events to further explore the work on stage; the New Works Circle Initiative, a program dedicated to the discovery, development, and production of new live theatrical works; special performances and programs for students and teachers with extensive curriculum support material; Script in Hand play readings to deepen relationships with audiences and artists; the renowned Woodward Internship Program during the summer months for aspiring theater professionals; Family Festivities presentations to delight young and old alike and to promote reading through live theater; youth performance training through Broadway Method Academy, Westport Country Playhouse’s resident conservatory program; and the beautiful and historic Playhouse campus open for enjoyment and community events year-round.